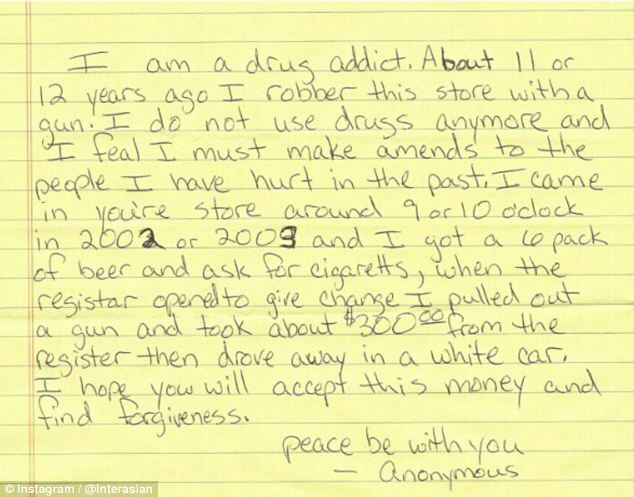 A family who run a grocery store in Nashville were astounded and moved by the actions of a former drug addict and thief who robbed them about 12 years ago. Somboon Wu, son of store owner Keosavanh Xayarath, explained that an unidentified man came into the InterAsian Market and Deli at the start of September and insisted they take an envelope. Though they were initially concerned about opening what he handed over, when they did they found a handwritten note of apology, a plea for forgiveness and $400 in cash. The family are clear that they accept the requests of the man who put them through such a scary experience all those years ago. Well that brought tears to my eyes. What a beautiful thing to hear. It goes to show ,There is good in all of us and no matter how bad you are at some point your conscience gets the better of you. I tell my clients your conscience is Spirit whispering in your ear, trying to get you to follow the path to truth and goodness. Your conscience never lets you down and always has your best interests at heart and we all have one. Bless them all, the man for clearing his conscience and the family for accepting his apology. Forgiveness is the greatest kindness we can give.